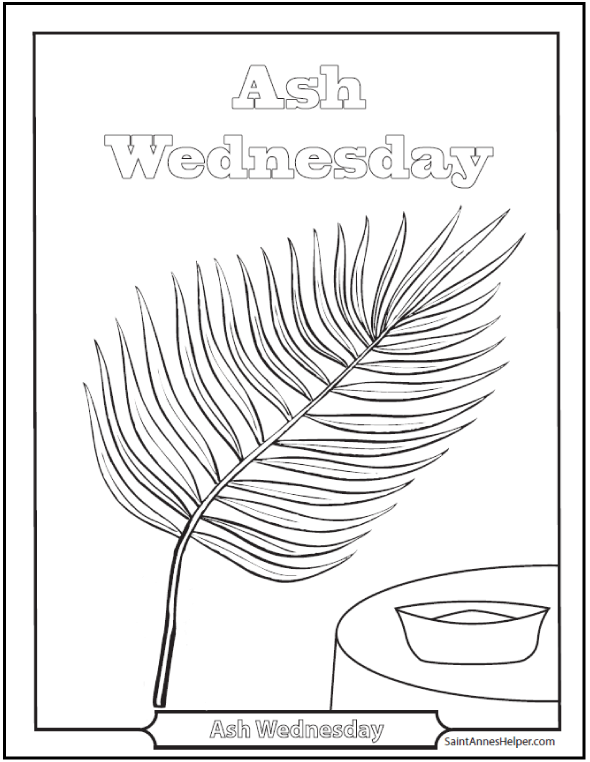 Use our Ash Wednesday coloring pages to teach about the Catholic season of Lent. Just as Jesus spent time getting ready for his vocation, Catholics honor these next forty days in penance preparing for Easter. Please be aware that Ash Wednesday is a day of fast and complete abstinence binding under pain of mortal sin. This is true even under the new rules. Good Friday, too. Catholics spend the 40 days of Lent preparing our souls to be worthy of the great sacrifice Jesus made for us on the Cross on Good Friday. Ash Wednesday and Good Friday are the only two days we must fast and abstain under pain of mortal sin. These sacrifices are best when we do them for the love of God. The traditional Lenten practices or penances are prayer, fasting, and giving alms for our sanctification and that of those in our care. Good Friday is the day of our promised Redemption after the Fall. Easter is the Resurrection. This is also the day to know what you want to offer up for Lent as the Lenten fast begins this day. Which penance will you practice. Why do penance? We do penance in order to pray better. I've seen it asked whether we should take our small children to receive ashes on Ash Wednesday. Having grown up with this and having taken our own children, my prompt response is, "Yes!" Outside of teaching your children to beware getting the ashes in their eyes, there are many graces they will receive. How do I know? I was reading the proper for the Blessing of Ashes and saw what the blessings asked on our behalf. I was so glad that the answers are right there in the Missal. First, most priests are good not to reload when they come to small children. 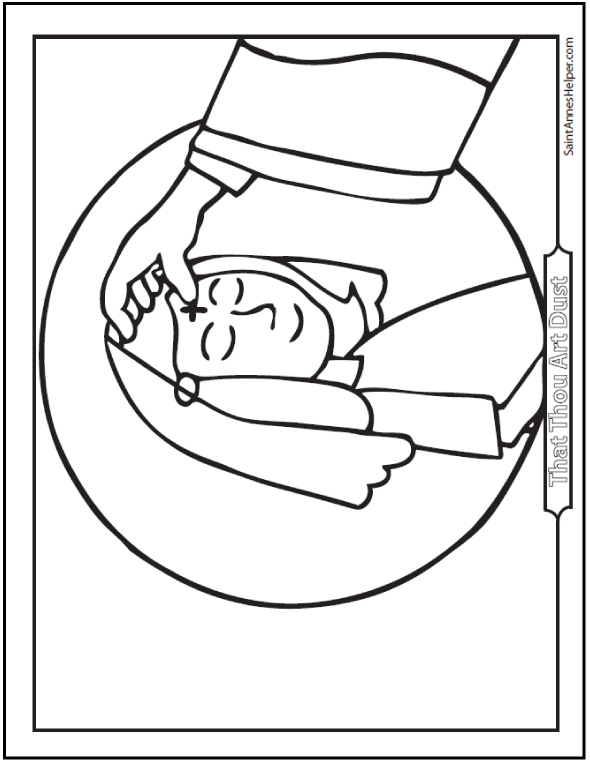 Second, if your child is "in arms", meaning small enough that you are carrying him or her, you can cover the child's eyes while Father is giving the blessing. You can also dust his eyebrows as you return to your seats. Practice at home by showing your children how to walk a line or stay squarely behind the person in front of them, not to look around, and to fold their hands pointing up so their prayers go to Heaven. Ash Wednesday, the feast of St. Blase, and the veneration of the Cross on Good Friday are great times for children to learn to walk in procession long before First Communion. That will be one thing learned that will reduce any pressure or anxiety on that great day. Back to ashes, you'll want to teach your children to kneel down and then, as Father approaches, to close their eyes. Let them know that they can wipe the dust from their eyebrows, nose, and cheeks; but not their forehead. The ashes are a sacramental and are not to be wiped away until night or the next day. One thing to watch is if your child pulls away. Let him go. It's better not to force him. He'll understand more later. Father often simply blesses the child as he passes; so it is still good to take your children with you to the rail. Trouble is so much more unlikely if you teach and practice before you go. If you have older children, have them join the fun as well. "It was originally intended for public penitents, but is now intended for all Christians, as Lent should be a time of penance for all." Here the word sacramental is an adjective being used as a noun in the "substantive use". Latin anyone? It's not referring to a sacramental grace as those received from the seven sacraments. Other examples of sacramentals are rosaries, prayer books, medals and other things that help us pray or to gain graces. The prayers of the Blessing of Ashes are what confer God's grace. Ashes have been a sign of grief, mourning, and penance since Old Testament times. Which graces do we receive? "... and bless these ashes, so that we, who know ourselves to be but ashes... and that we must return to dust, may deserve to obtain pardon and the rewards offered to the penitent." " Let us pray, ...that whosoever shall be sprinkled with them for the remission of their sins may receive both health of body and safety of soul." "Let us pray, ... so that we ... may deserve to obtain of Thy mercy the pardon of all our sins...."
" Let us pray, --O God, who art moved by humiliation, and appeased by satisfaction: incline the ear of Thy goodness to our prayers and mercifully pour forth upon the heads of Thy servants sprinkled with these ashes the grace of Thy blessing: that Thou mayest both fill them with the spirit of compunction, and effectually grant what they have prayed for: and ordain that what Thou has granted may be permanently established and remain unchanged. Through Christ our Lord. Amen." Did you see that? "... and ordain that what Thou hast granted may be permanently established and remain unchanged." These are the reasons to receive ashes. How wonderful! The Collect of the Mass of Ash Wednesday is an awesome prayer for the beginning of Lent. "Grant, O Lord, to Thy faithful people, that they may undertake with fitting piety the venerable solemnities of fasting, and complete them with steadfast devotion. Through our Lord Jesus Christ, ...."
To undertake and to complete. Perfect. "Thus saith the Lord: be converted to Me with all your heart, in fasting and in weeping and in mourning. And rend your hearts and not your garments, and turn to the Lord your God...."
"When you fast, be not as the hypocrites, sad. ... when thou fastest, anoint thy head and wash thy face, that thou appear not to men to fast, but to thy Father who is in secret: and thy Father who seeth in secret will repay Thee. ..."
These many graces are wonderful reasons why we and our children should receive ashes. Before the Ash Wednesday Mass the priest blesses the burnt palms from the previous year's blessed palms of Palm Sunday and the congregation comes to the communion rail to receive the ashes made made on their foreheads in a Cross shape. St. John the Baptist insisted that we do penance to prepare for Jesus' coming, Lent is the most serious season to do it. If you're new to the Faith and wondering What is lent? Check out that link. The date for Ash Wednesday changes every year because the date for Easter is variable. Most of us need a liturgical calendar to keep up with the variable dates, especially now that Pope Benedict XVI has allowed the 1962 Missal with its very different Catholic calendar from the one that most Catholics use today. I love the book A Doctor at Calvary by Pierre Barbet, M.D. A visitor wrote about using this book as a family meditation and said, "Although certain sections of the book are a bit technical, it has proved an excellent way to really try to "feel" Our Lord's pain in His Passion, even for little ones." Personally, Dr. Barbet's book is my favorite book that I have read during the Lent season for this very same reason. When I told our children an abbreviated version of what happened on Calvary from his perspective our children began to have a better grasp on the pain that Jesus suffered for each of us. Nothing makes us rejoice on Easter like a good Lent! The harder the Lent, the more we rejoice on Easter Sunday. Most years we find it plenty to do the traditional Lent fasting and abstinence. We also make an effort to have way less food during the week and no sweets - except on Sunday. Many Catholics spend Lent fasting and increasing their prayers during Lent. There's an excellent description of the new and the old rules and requirements for Lent and fasting and abstaining check out this this list and explanation. For Lent, I wrote a nice long list of forty penances for the family to do on one color of paper. Then on another color of paper, I wrote a long list of prayers. Then, I cut up the slips of paper and put them in a basket. Each morning, one slip of paper is drawn for a penance and another slip is drawn for a prayer. You could even let the older children become involved with writing some prayers and penances, too. As you can see, this is merely a small list just to get you thinking. For some, this list may seem too "light" for a Lenten penance, for others, maybe it seems too much. I think though, for my family it will be just right. I've tried in years past to help the kids keep track of their Lenten penances and it has always proven too difficult a task with so many children all trying to do different things; that very quickly, no one is doing the things they had wanted to try to do for Lent. This method, I hope, will help us all have a successful and very fruitful Lent! It was also very fun for me to assemble the list of prayers because there are so many, many in the Church that we are unfamiliar with. I wish you a Holy and very fruitful Lent! We used rocks to represent sacrifices made each day during Lent and have those plain, ugly rocks "turn into" beautiful polished colored stones Easter morning - all of our sacrifices build up treasures in heaven. A few years ago, we were having a difficult time with prayers and such as my 3 and 5 year olds were so busy, homeschooling, gardening, caring for horses, and pregnancy with medical difficulties seemed overwhelming. I was overwhelmed and my DH could not assist. Lent was upon us. Ash Wednesday was coming. We needed to do something to improve our prayers, practice penance, and begin to teach the little ones of our Catholic ways. The thought of trying to keep track of 4 children's penances and my own seemed impossible. So, after much thought and contemplation, and permission from our pastor, we came up with something different. We decided to fill 2 baskets with a lottery of prayers and penances. A prayer from one basket and a penance from the other to be selected each night for the next day. We skimmed through the Raccolta and Treasury of Chaplets to find prayers and chaplets for our baskets. It was a wonderful thing looking at them with my husband and finding prayers which reflected humility, beauty, and challenge. The penances we tried to vary from very simple; like only drinking water between meals, to the more difficult; making a card to take to a sick friend, and no complaining for a day. And of course we set penalties if a penance was not kept. For example, one who complained had to make a sincere act of contrition and then pray 3 Aves for the Holy Souls in Purgatory. We tried to incorporate the Spiritual and Corporal Works of Mercy into our penances whenever possible. It was not easy since the children were 3-12 years old, and we wanted to make certain that we all would have a reasonible chance to succeed. DH typed and printed the prayer and penance selections. In each basket they went. The lottery began. The children actually looked forward to see what tomorrow would bring and rarely complained. Focusing on one day made even the more difficult penances seem attainable and Lent went by quickly. My older children did keep a journal of what we did and prayed each day noting no only when and who failed, but also the funny little anecdotes which always accompany such tasks. It has filled our minds and hearts with beautiful memories and achieved it's goal in teaching that there is joy in penance. So, this year will return to this lottery as the youngest are 5 and 6 years old. They need to learn as my older children did. So nice to read about your Lenten activities. We make the Crown of Thorns on Ash Wednesday just like the one you make. The difference is that when the children have taken away a thorn they are allowed to add a flower instead as a sign of Jesus' joy when children are nice, making sacrifices, etc. At Easter time the crown is (hopefully!) full of flowers and then a priest can bless it and you can put it on your front door (if it's not exposed to rain and wind) as a beautiful and yet meaningful decoration. At Mardi Gras we eat "semlor", that is buns with whipped cream and almond paste. You take an ordinary bun, cut off the top and then make a big hole in the bun (leaving the bottom of the bun intact though). You fill the hole with almond paste, put some whipped cream on top of it and then put the top back over the cream. You decorate the bun with ... oh, I can't find the English word for it in my dictionary, Can anyone please help: in Italian it's "zucchero a velo", do you know what that is in English? Veiled sugar? No...??? We get 5x7 Stations of the Cross pictures and post them in a row along the back of the couch. 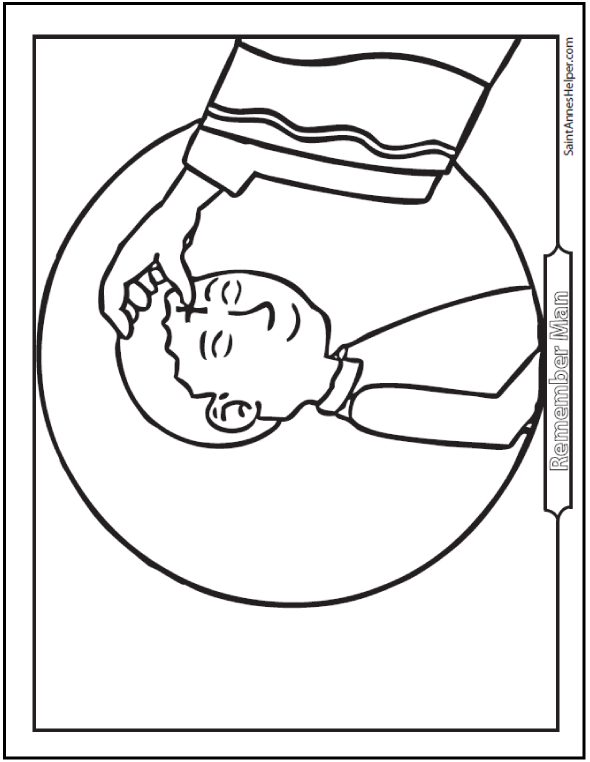 It helps the kids to visualize the passion while we pray the Stations. Many times during the day I find them studying the pictures. Kathy, St. Louis "Rome of the West"
I found these online. They sure sound good! seasonings, and rice to the lentils. Cover and cook for 20 minutes. be eaten hot or cold. Serves 4-6. Finely chop all vegetables except the grape leaves and mix well with the uncooked rice. Place a heaping tablespoon of this mixture on a grape leaf and roll up, make sure the ends of the grape leaves are folded in to secure the filling. Continue until all mixture and grape leaves are used. Arrange the rolls in a pan for cooking. Barely cover the rolls with water. Sprinkle about a tablespoon of salt over the top. Cover the pan and cook on medium heat for about 15 minutes. Add the ½ cup of lemon juice and cook for another 10 minutes or until all liquid has been absorbed.